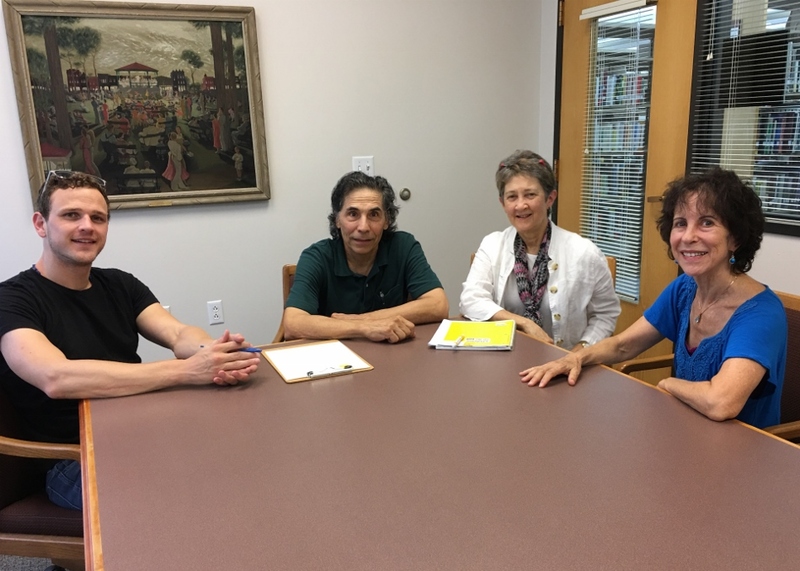 (Left to right) Jeff Shipley, Joe Mandarino, Marg Dwyer and Julia Mandarino, all of Fairfield, after an Aug. 13, 2018, interview with IowaWatch about efforts they are making to lead Jefferson County, Iowa, residents to have respectful, meaningful conversations about hot-button political issues on which the residents disagree. Shipley is former Iowa Republican State Central Committee member and former Jefferson County Republican chairman who ran a losing bid in 2014 for Iowa House District 82. Joe Mandarino, a retired Maharishi University of Management business and statistics professor, and Julia Mandarino, a retired Iowa Wesleyan University psychology professor, are trained moderators for the Better Angels organization that brings together conservatives and liberals for meaningful conversation. Dwyer is a former Fairfield Community School District board member and active Democrat who ran unsuccessfully for Jefferson County supervisor in 2016. DON’T MISS AN IOWAWATCH STORY. SUBSCRIBE NOW TO OUR NEWSLETTER. Deep, passionate political disagreement is keeping many voters unwilling or, in some instances, incapable of having a sustained, civil conversation about topics that provoke that disagreement. The Pew Research Center reports that the disagreement now is deeper than at any other time during the last two decades. 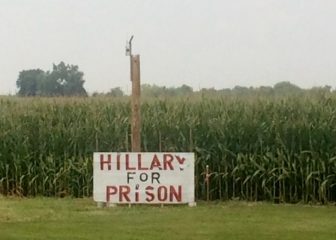 This “Hillary For Prison” sign was posted along a highway east of Fairfield, Iowa, when this photo was taken Aug. 13, 2018. But a small group of Eastern Iowans interested in politics are trying to have civil conversations about the issues dividing them. They’ve joined a nationwide movement called Better Angels, a bipartisan citizens’ effort to bring Republicans and Democrats together to talk to one another in a civil manner to influence the nation’s direction. A little more than a dozen residents in Jefferson County, Iowa — county seat, Fairfield — have been meeting in workshops to find ways to advance the conversation about hot-button topics like abortion and tax reform. They are Republicans and Democrats, alike, and led by Julia and Joe Mandarino, both of Fairfield. Julia Mandarino has a doctorate in psychology and was a psychology professor at Iowa Wesleyan University in Mount Pleasant, specializing in marriage and family relations, before retiring in 2008. Joe Mandarino is a retired business and statistics professor from Maharishi University of Management. He has a doctorate in probability and statistics. IowaWatch sat down with the Mandarinos and two Fairfield residents with diverse political views for an IowaWatch Connection radio report/podcast — Democrat Marg Dwyer and Republican Jeff Shipley — and also the IowaWatch reporter whose story was the catalyst for this radio report/podcast, Matthew McDermott. TO LEARN HOW IOWAWATCH’S NONPROFIT JOURNALISM IS FUNDED AND HOW YOU CAN SUPPORT IT, GO TO THIS LINK. This IowaWatch story was republished by InDepthNH.org under IowaWatch’s mission of sharing stories with media partners. Alliances political leaders make take some of the blame for polarization. Second in a series.